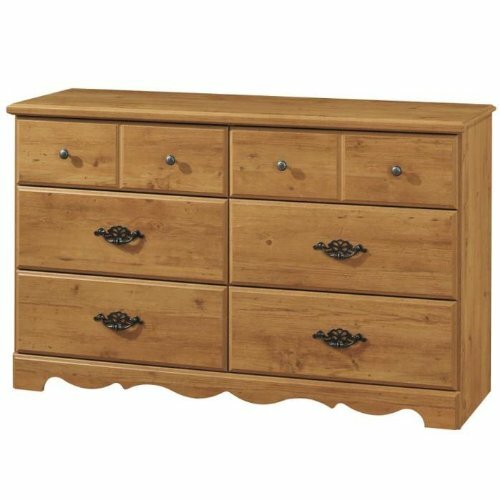 This country style double dresser is crafted with care and attention, featuring a scalloped apron, beautifully detailed metal exterior hardware, and a warm Country Pine finish. The spacious drawers of the Prairie Double Dresser will provide ample storage for any room in your home. Features: Dresser features solid particleboard construction Dresser has a country pine finish Constructed of CARB compliant materialsDresser features six spacious drawers with metal handles in an antique finish Specifications: Overall dimensions: 32"H x 53"W x 16"D Drawers are 14" deep and 5" high.